The KIP C7800 is a color and black & white high production print system. The system is a comprehensive solution for all types of wide format printing tasks that require the highest levels of quality and performance. Comes with an easy-to-use application that is designed to provide users with a quick and precise means of producing high-quality color and b&w print sets. 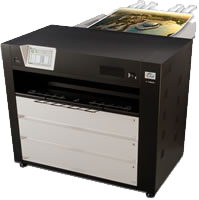 The KIP C7800 Large Format Printer is perfect for any and all graphical and/or technical projects. With a wide array of production advantages, such as dedicated RIPs, submission methods, folding, trimming and more the KIP C7800 produces only the highest level of quality, speed and cost-effective solutions. Contact us today to see if this product is right for you. KIP Print network printing software is an easy to use application designed to provide operators with a fast and accurate means of producing high quality color and b&w print sets. An intuitive ribbon style interface with an emphasis on job building; featuring column browsing, color thumbnail previews and total preflight control. The ability to produce wide format prints using nothing more than an email with attachments and a few key words helps keep mobile clients on the go to stay productive. Windows driver supports 32 or 64 bit color and b&w Windows printing, set collation, job accounting, media selection & folding features. Includes support for legacy and current versions of the Windows operating system. Driver AutoCAD driver enables color and b&w color and b&w printing directly from AutoCAD applications with advanced vector/raster print data control. Includes support for legacy and current versions of AutoCAD.